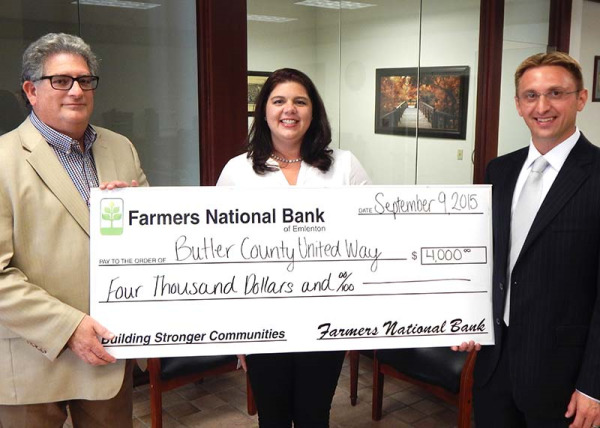 Accepting the donation on behalf of United Way of Butler County was Kierston Hobaugh, Executive Director. Representing Butler County Tourism & Convention Bureau was Jack Cohen, President. Presenting the check on behalf of The Farmers National Bank of Emlenton was Matthew Lucco, Senior Vice President and Chief Financial Officer. The United Way assists individuals and families by providing educational opportunities, financial stability and promoting healthy lives within the community. For more information, please visit www.butlerunitedway.org or call 724-285-4883.